Set-Up Time: 2:30 – 4 p.m. Event Time: 4 – 7 p.m. Looking for an opportunity to get involved with MU campus organizations? Want FREE food, music and fun? Well, Fall Fest 2017 is the place to be! 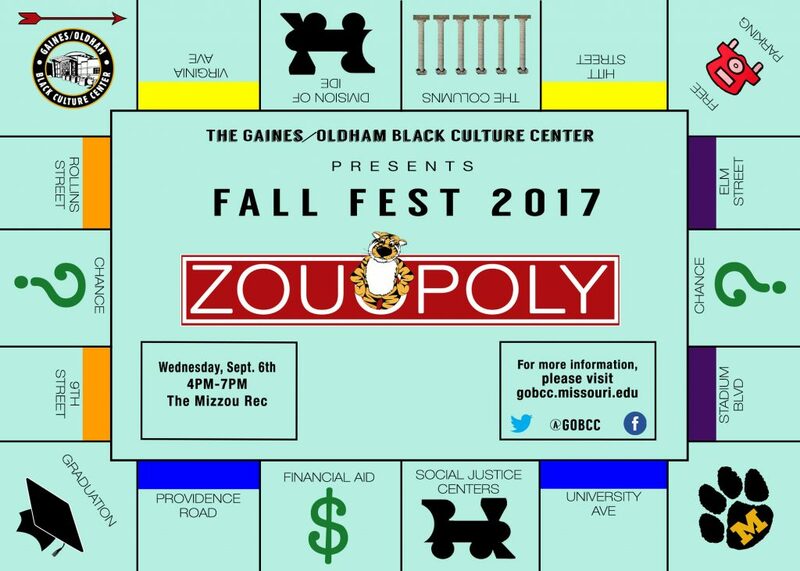 Fall Fest is an annual event hosted by the Gaines/Oldham Black Culture Center introducing over 1,000 underrepresented students to student organizations, faculty/staff, University departments, and Columbia businesses. Some of the event participants’ on-hand will include professional organizations, academic departments, Greek organizations, dance teams, churches, local barbershops and hair salons! Also don’t miss performances from the National Pan-Hellenic Council (NPHC), Mizzou dance teams, and more! This event is free and open to the public. If you are interested in registering for a table at the Fall Fest 2017, please register below by Thursday, August 31, 2017. Your table reservation is for a shared table with another organization/department. If you have any questions, contact the Gaines/Oldham Black Culture Center at 573.882.2664.